We saw quite a few movies during the holidays because our son was home sick this past week. But before that, we kicked off our holiday season and celebrated our sons finishing final exams and their semester with a visit to our recliner theater to see Star Wars: The Last Jedi. 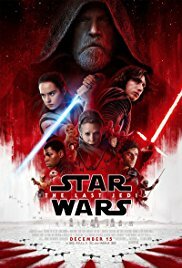 To prepare, my husband, older son, and I rented Star Wars: The Force Awakens (my review at the link - no spoilers) on Amazon the night before, since our son had missed it two years ago - that refresher was perfect, and I think I enjoyed the new movie more with its prequel fresh in my mind. So, The Last Jedi picks up right where The Force Awakens ended (don't worry - no spoilers here). On the Dark side, the Empire - now regaining its strength as the First Order - is under the direction of Kylo Ren, played with great complexity by Adam Driver. And on the side of the Light, Rey, played by Daisy Ridley, is now a part of the Resistance, under General Leia, the last role for Carrie Fisher. Finn, played by John Boyega, and Poe, played by Oscar Isaac, are both working for the Resistance as well. Rey is on a mission to find Luke Skywalker, who has isolated himself in a remote corner of the universe. She wants him to train her as a Jedi. As with all the Star Wars movies, this one is about good versus evil on a grand scale, but on a more personal level, this film zeroes in on the youngest, most powerful members of each side: Rey and Kylo Ren. The two of them, though on opposite sides, seem to have a potent connection to each other which is at the center of this story. All four of us thoroughly enjoyed this latest Star Wars installment, and I was especially glad we re-watched the previous movie the night before. The Last Jedi has everything you expect from a Star Wars movie - big battles and light sabres, yes, but also humor, romance, and intimate moments. The acting here is excellent, both in the Star Wars old-timers and the newer additions. This movie adds Rose, played by Kelly Marie Tran, as a fearless mechanic who plays a key role. The droids are always an amusing element to these movies, and here we get our new fave, BB8, plus our old friends, C-3PO and R2-D2. Chewbacca is back, along with several other strange creatures, including fox-like animals made of crystal and the adorable Porgs that populate Luke's island. Action, adventure, an intricate plot, drama, romance, and humor - what more could you want from a movie? Star Wars: The Last Jedi was just released in theaters on December 15 - this is definitely one to see on the big screen, if you can manage it! It is scheduled for release on streaming in March 2018 and on DVD in April. I saw the original three Star Wars movies, but loved them so much I was afraid to see any more of them. Oh, Helen, then you will LOVE these last two in the series (mentioned here in this post)...because they are the continuation of the original story! Han, Leia, and Luke are central characters here, only 30 years later. Definitely try these two!